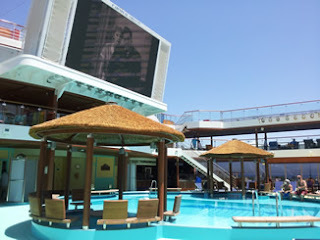 Having already cruise on Carnival Breeze's younger sister, the Carnival Magic also in the Mediterranean in 2011, I was intrigued to see how they had improved what to me was already a very good and well thought out ship. 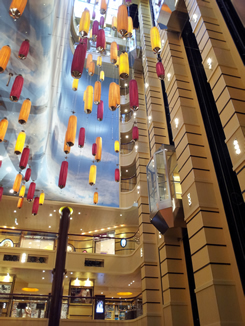 The first thing that I noted on embarkation was the calmer more subtle tones in the central atrium, not that the Magic was all glitzy glamour, no it was just a very calming atmosphere and I liked it, I liked it a lot. People quite rightly have tended to perceive Carnival at flashing lights and bold brash colours, but that was the old Carnival and still very popular in North America. But there has been a wind of change blowing and through Carnival's Fun Ship 2.0 upgrades, there is now a class of ship that should appeal to most, and because there's two of them you can cruise with Carnival in Europe or North America. However for 2013 both the Magic and the Breeze will be taking a break from Europe and will be replaced for a season by the Carnival Sunshine after her 150 million dollar Funship 2.0 refit. For the non flyers, you can board the Carnival Legend in Dover in 2013 offering a series of cruises to the Fjords, Baltic Capitals and the Mediterranean. Back to the Carnival Breeze and some of the subtle changes from the Magic. I really like the small side dish & sauces islands at the Beach Pool and they are situated right opposite Guy's Burger Joint and the Mexican Blue Iguana Cantina which has incidentally replaced the Pizzeria (this is now further back where the Deli was at the back of the Lido Marketplace). 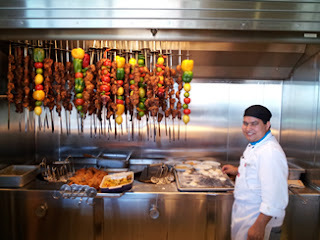 Lovers of Indian cuisine can still experience the spices from the Tandoor which is also at the back of the Lido Marketplace adjacent to the Tides Pool & Bar. As you can see there is no shortage of eating venues and a splendid range of both healthy options and some rather less healthy options, I am of course referring to the 1800 calorie busting burgers from Guy's Burger Joint..!!! A very very popular addition to the Carnival Breeze is the Bonsai Sushi Bar on deck 5, with fantastic varieties of sushi, sashimi, and rolls along with bento boxes and the venue’s own interpretation of a sushi boat – in this case, a sushi “ship.” The great news is that with prices ranging from $1 for appetizer-sized portions to $15 for a sushi ship for two, it is superb value. Still on the subject of food - I highly recommend the Fahrenheit Steakhouse on deck 5. The cover charge has been increased slightly for $30 to a still very acceptable and justifiable $35 per person cover charge. This meal is full of surprises and if I dare recommend anything, it is the Escargot which is presented in a way I have never seen before and the mash potato. There you have it, a very relaxing evening where the table is your for the evening, but bear in mind the ship has up to 4,000 passengers and the restaurant will only entertain a very small number of covers - therefore book before you cruise or as soon as you get onboard. Oh I nearly forgot - you may wish to place a small wager with your fellow diners as to who can finish in totality the cheesecake for desert..!! Carnival doesn't really do formal in the true sense of the word, but that is not to say that people do not dress up for the evening, it's just that you won't see everyone walking around in tuxedo's and ball gowns in a way that is expected onboard say, a Cunard ship.As you can see from our photo - smart shirts and trousers is the attire for most evenings. In fact the formal evening coincided with our reservation the Italian restaurant on deck 11 - Cucina del Capitano. The cover charge is a nominal $12 per person so this has to be worth a visit. However the restaurant is open at lunchtime with a different and smaller menu choice and there is NO cover charge! 1. At lunchtime they serve Lasagne and it is fantastic 2. In the evening they do NOT - but the portions in the evening are huge and in my opinion a little off putting, in fact most of our party left part of their main course!! I was onboard for 5 nights but I did get a chance to experience the ships shuttle service in Palma which I have to say was excellent. Only €5 pp for the return journey to Palma Cathedral which is much cheaper than certain cruise lines..!! The Red Frog Pub in the evenings is certainly a busy place where people congregate after dinner and you are always guaranteed that special Caribbean service with a smile. You must try a pint of Thirst Frog, you won't find it anywhere else! The live music is extremely popular and the guys playing the guitar will always oblige with requests throughout the evening, or you can sit outside and watch the sunset. 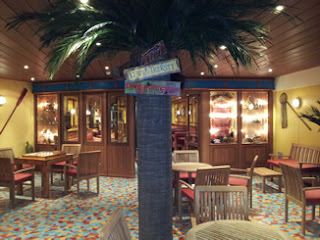 This is probably my favourite bar on the Carnival Breeze or Carnival Magic. 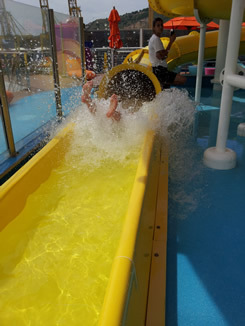 There's great fun to be had up on deck both wet and dry...and by far the most popular activity is the water slides of which there are two. Two different coloured tubes with different outcomes just have to be tried, young or old. Then for those who seek thrills and are not scared of heights - try the crazy ropes coarse high above the Lido and just behind the Sea Screen. You can take the easy route or the more difficult route, but try not to hold on to your safety rope - that's cheating..!! Moving away from the activities and into a relax mode - make sure you spend some time in Serenity. Adults only with comfy sun-beds, hammocks and cabana's and a private bar, this haven up on deck 14 at the front of the ship is the place to be. This is where I spent almost every afternoon, along with everyone else reading 50 Shades of Grey..!!! 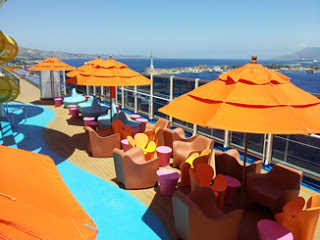 I didn't get the chance to see the shows, but I did manage to shake a few moves in Liquid night club until the early hours of the morning with DJ X, and I never made breakfast on any morning - it was after all a chance to experience "Fun Ship" cruising! 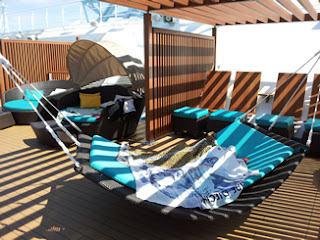 In closing, the key things for me were the cabins which were very well furnished and the passenger corridors which really do give you a feel of a resort holiday in the Caribbean and probably the best design I have seen yet. The large Caribbean images as you walk past each cabin and the wooden style cabin doors all add up to a very chilled yet welcoming feeling. 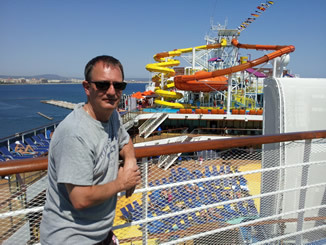 The service was excellent, the comedy club worked well now that there is a mixture of comedians including Brits and the live music late afternoon around the pool on a sea day was great and really added to the Fun Ship atmosphere. Aside from the ridiculous portions in the Italian restaurant I couldn't find anything to moan about. Unless you have the German sun-bed genes in your body, you will need to get up at 6am to secure a subbed around the main pool on a sea day, but we always found a sun-bed on the decks even at 12 noon after a quick look around. 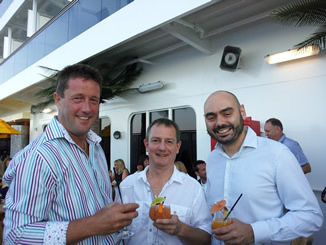 Days in port - no problem and after all, who gets off in Messina?? So if you are looking for a resort style holiday afloat, smart and casual but no tuxedo required, with great food and entertainment on a modern well designed cruise ship - you will be hard pressed to beat the Carnival Breeze. 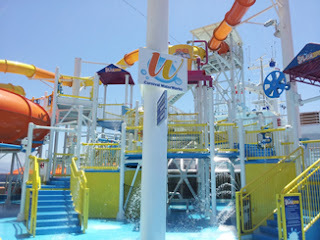 Ask my team at The Cruise Village for a great deal with Carnival. 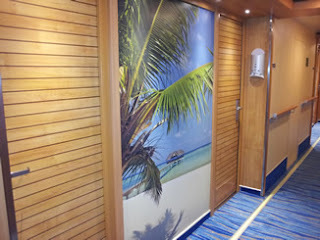 This is a cruise news blog entry by Phil.